Tomorrow’s Technician and B’laster Corporation – makers of the penetrant, PB B’laster – are excited to announce the Top Four Finalists of the first-ever “Instructor of the Year” program. 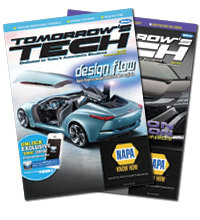 In partnership with Tomorrow’s Technician magazine, the B’laster Instructor of the Year program recognizes the automotive technology instructors at high schools, vo-tech programs and community colleges who think outside of the toolbox. Judges from B’laster selected the Top Four Finalists from the seven monthly finalists featured in Tomorrow’s Tech. The instructors entered the contest by sharing their stories about an unconventional build, project or system that makes their classroom different with Tomorrow’s Tech. The Top Four Finalists will each receive a swag bag and products from B’laster for their achievement and be in the running for the Instructor of the Year Award, announced in May. A one-of-a-kind B’laster Instructor of the Year trophy. For more information about the B’laster Instructor of the Year program, visit tomorrowstechnician.com/instructor-of-the-year/.